Teach your students poetry writing using this Poetry Writing Bundle with Interactive Notebook and Lapbook. 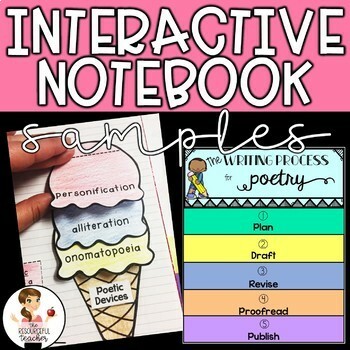 Take the confusion out of writing poetry and give your students fun and engaging activities to practice Poetry Writing! 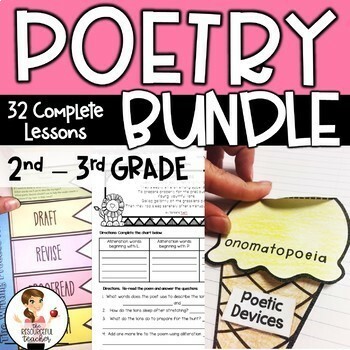 This BUNDLE helps students creatively learn the basics of poetry. The unit builds on that concept by teaching 4 poetic devices: alliteration, onomatopoeia, personification, and rhyme. Students also learn about two types of poetry: Sound Poems and Weather Poems. They use the 5 stages of the writing process for each poem they write. Individual writing rubrics are used for each poem to assess the quality of their work. Also included is an optional "Poetry Cafe" where students invite parents, administration, teachers, other grades to come and listen to them read their poetry. Invitation cards are included. Throughout the unit, students complete a lapbook which summarizes the information learned in the unit and is also encouraged to be shared with visitors at the "Poetry Cafe." 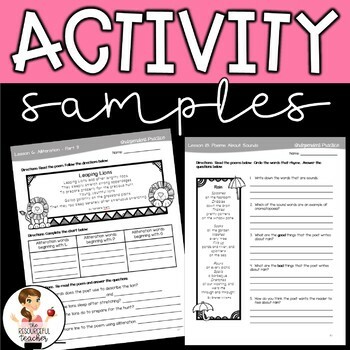 This unit consists of 32 lessons complete with lesson plans, answer keys, directions, and samples. 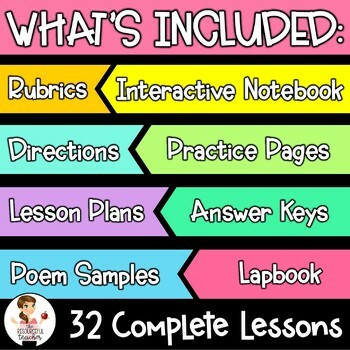 When you download this BUNDLE, you will also receive a file that includes all 32 lessons as a unit, numbered and scaffolded. - Students will be able to define poetry. - Students will be able to explain the purpose for writing poetry. - Students will be able to understand that not all poems have to rhyme. - Students will be able to define onomatopoeia. - Students will be able to identify onomatopoeia in poetry. - Students will be able to analyze a poem with onomatopoeia. - Students will be able to identify onomatopoeia. - Students will be able to write sentences or phrases using onomatopoeia. - Students will be able to define alliteration. - Students will be able to identify alliteration in poetry. - Students will be able to write words that demonstrate alliteration. - Students will be able to write a complete sentence with alliteration. - Students will be able to analyze a poem with alliteration. - Students will be able to define personification. - Students will be able to identify personification. - Students will be able to write a sentence using personification. - Students will be able to analyze a poem with personification. - Students will be able to identify rhyme in poetry. - Students will be able to words that rhyme. - Students will be able to analyze a poem with rhyme. - Students will be able to give examples of poetic devices: onomatopoeia, personification, alliteration, and rhyme. - Students will be able to define that a poet is a person who writes poetry. - Students will be able to identify their favorite poetic device to use when writing poetry. - Students will be able to define how to analyze poetry. - Students will be able to identify different poetic devices used in poetry. - Students will be able to analyze poems about sound. - Students will be able to brainstorm ideas of the topic of their sound poem. - Students will be able to create an illustration of their sound poem. - Students will be able to complete a web to organize their ideas. - Students will be able to write the first draft of their sound poem. - Students will be able to revise the first draft of their sound poem. - Students will be able to proofread the first draft of their sound poem. - Students will be able to recognize errors. - Students will be able to publish the final draft of their sound poem. - Students will be able to examine poems about weather. - Students will be able to brainstorm ideas of the topic of their weather poem. - Students will be able to create an illustration of their weather poem. - Students will be able to write the first draft of their weather poem. - Students will be able to revise the first draft of their weather poem. - Students will be able to proofread the first draft of their weather poem. - Students will be able to publish the final draft of their weather poem. Written for 3rd grade but could easily be adapted for 2nd or 4th.